Apoptosis signal-regulating kinase 1 (ASK1) is an important mediator of the cell stress response pathways. Because of its central role in regulating cell death, the activity of ASK1 is tightly regulated by protein-protein interactions and post-translational modifications. Deregulation of ASK1 activity has been linked to human diseases, such as neurological disorders and cancer. 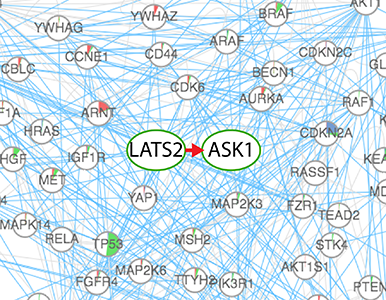 Here we describe the identification and characterization of large tumor suppressor 2 (LATS2) as a novel binding partner for ASK1. LATS2 is a core kinase in the Hippo signaling pathway and is commonly down-regulated in cancer. We found that LATS2 interacts with ASK1 and increases ASK1-mediated signaling to promote apoptosis and activate the JNK mitogen activated protein kinase (MAPK). This change in MAPK signaling is dependent on the catalytic activity of ASK1, but does not require LATS2 kinase activity. This work identifies a novel role for LATS2 as a positive regulator of the ASK1-MKK-JNK signaling pathway and establishes a kinase-independent function of LATS2 that may be part of the intricate regulatory system for cellular response to diverse stress signals.